Heat oil in 12- inch skillet over medium-high heat. Add chicken and garlic; cook, stirring 5 to 7 minutes or until chicken begins to brown. Add broccoli, carrots, onion, Italian seasoning, red pepper flakes and salt. 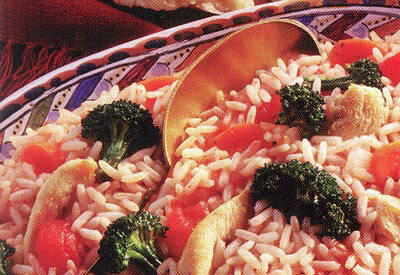 Cook, stirring 3 to 4 minutes or until vegetables are tender. Add rice and tomatoes. Stir until blended and thoroughly heated. Remove from heat; stir in Parmesan cheese.